First, you take some apples and some cinnamon and some sugar and some lemon juice and mix it all up. Then you take your trusty egg roll wrapper and brush egg wash around all four sides. Then you give it a little tuck here and a fold there, like so. Then you roll the pretty little thing up all nice and neat. Bake until they’re all golden and oozy (and just before they’re done, brush them with some melted butter and sprinkle with cinnamon sugar). Because that’s just how we roll. You can do that, can’t you? I knew you could. Because you’re awesome. 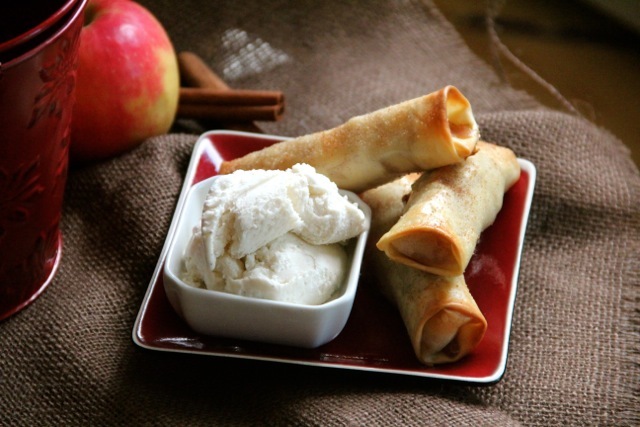 Then you will have golden, crispy egg rolls filled with perfectly cooked, steamy fresh apple pie filling. Good grief, Charlie Brown! Can’t you just smell it? It’s divine. Make some. The whole family will love it. Preheat oven to 375. Line a large baking sheet with parchment paper and lightly spray the parchment with non-stick spray. In a bowl, stir together the apples, lemon, and sugar. Add the flour, spices, and salt. Beginning with one egg roll wrapper, lay it out on a work surface (I used a cutting board) and brush egg wash around each edge. Scoop about 2 tablespoons of apple filling onto one edge. Fold in the sides and roll up the egg roll tightly. Place on the parchment-lined baking sheet. Repeat until all the filling has been used.